Acon Digital Verberate Surround is a surround capable edition of Verberate, a plug-in that simulates real acoustical surroundings with a new degree of realism. Verberate Surround supports all common surround formats, including quadraphonic audio, 5.1 and 7.1 surround. Dense and realistic early reflections are simulated independently for each input to output channel pair. The late reverberation network uses up to four channels in a quadraphonic setup to simulate energy fluctuations on both the left to right and the front to back axis. Proprietary and novel methods ensure that all output channels are uncorrelated. Verberate Surround share the clean and unobtrusive sonic quality that has quickly made Verberate popular and blends just as seamlessly into your audio material. 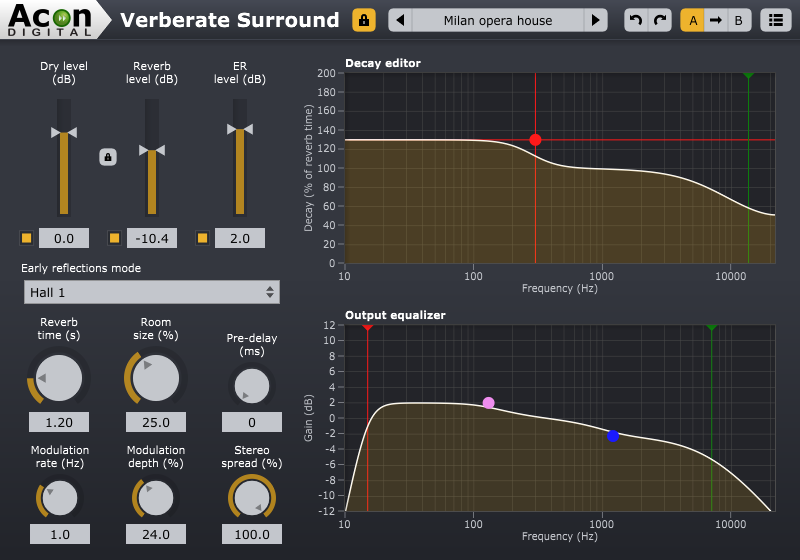 Verberate Surround is the perfect choice if you are working with surround audio and like the clean and realistic quality of convolution reverbs, but are in need of more flexibility and tweaking possibilities without sacrificing realism. Impulse responses obtained from measurements of Acon Digital Verberate Surround sound and look almost indistinguishable from measurements of real acoustical spaces. The figure illustrates the physically correct arrival times in an impulse response obtained from the medium hall preset in Verberate Surround with the source placed on the left channel. A large catalog of factory presets is included and a clear and to-the-point graphical user interface hides the internal complexity of the plug-in. Graphical representations of the parameter settings simplify the search for a desired sonic quality, such as the output equalizer frequency response curve or the curve showing frequency dependent reverberation times. As with all Acon Digital plug-ins, functionality and audio quality are the top priorities. Acon Digital Verberate Surround is available for both Windows (PC) and OS X (Macintosh). Both 32 and 64 bit versions are available, and the plug-in formats VST, AAX and Audio Units (OS X only) are supported. A valid license key for the upgrade eligible product is required. Be sure to check out this plug-in. It’s one that you’ll definitely want to add to your collection. Verberate has been nominated for the SOS awards 2015 in the effects plug-in category. A really nice sound […] Simple interface, great sound and a great price too. Thanks to Keith J. Hersch for the Maroon Park, Light As Air and Supermouse surround demo pieces, and to David William Hearn for the Orchestral and Reflections demo pieces. Note: A HTML5 compatible browser with a properly installed AAC decoder is required to playback the files directly from your browser. Please use the download links if your browser doesn’t fulfill these requirements. 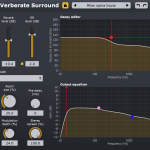 Groove3 gives a great overview of Verberate Surround. Mike from Pro Tools Expert takes a tour round the Acon Digital Verberate algorithmic reverb plug-in and likes what he finds. Carlo Libertini takes a look at Acon Digital Verberate 1.6 and demonstrates the key features. Great care has been taken to provide a clear and uncluttered user interface. Support channel format conversions, such as mono to stereo, stereo to 5.1 surround, etc. Please note that many VST hosts don’t work properly with surround capable VST plug-ins. We strongly recommend to try the demo version of Verberate Surround prior to placing your order.